Make that New Year’s resolution stick with these tips for real—and long-lasting—weight management. Healthy weight loss can transform your body "inside and out." Starting out the new year determined to lose weight? 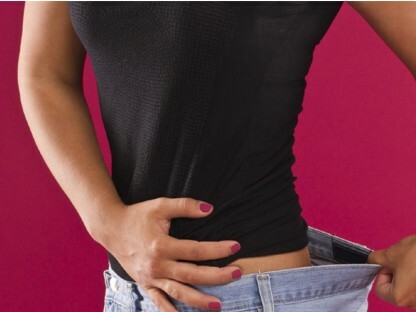 Our expert describes the role of diet in healthy weight loss. My goal as a doctor is to help my patients become healthy and stay that way. For many patients, that involves losing weight. Educating my patients about the real underlying causes of weight gain, teaching them about nutrition, and working with them to lose weight—focusing on healthy weight loss—is one of the most challenging and rewarding aspects of my job. With healthy weight loss, patients get the opportunity to experience the transformation of their bodies, inside and out, and the increased energy and confidence that comes with that. They also experience the power of food as medicine. When patients’ symptoms go away or their lab results come back remarkably improved, they’ve experienced how food is more than just calories—food is information that controls every aspect of biology and health. You may be wondering what the best diet is to lose weight, to feel good, and to get—and stay—healthy. The truth is that there is no one right, best way to lose weight. Every one of us thrives on something a little different and it can change over time. As the New Year begins, a great question to ask yourself is, “What do I require at this point in time to be healthy and to feel good?” Is weight loss on that list? If it is, I want you to feel empowered, instead of overwhelmed or confused, about the many healthful, effective choices you have to meet your weight loss goals. While our knowledge about healthy weight loss and nutrition has never been greater, it’s easy to get confused and paralyzed—or to fall prey to the belief that you have to find and stick to the one, right way to lose weight or else you’ll never be successful. But you don’t. If research has shown us anything, it is that there is no one best diet. Whether you decide to go paleo and shun grains and beans, or become vegan and forego all animal foods, or do something totally different or in between, there is a way of eating that can help you lose weight in a healthy way that fits your current needs, preferences, and health challenges. While proponents of the various diets may defend their own plans religiously and point to the research showing it to be superior for weight loss, the truth is that they are cherry-picking studies to support their point of view. For instance, the research on both vegan and paleo diets show they are effective for weight loss, type 2 diabetes, high cholesterol, and more. 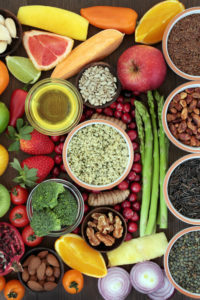 [1-5] When you read between the lines of the actual studies and not just the headlines, you discover that there are characteristics of a healthy diet almost everyone agrees on. Even the controversial areas can be simplified. Low glycemic load. Focus on the glycemic load of your diet, making sure it is low in sugar, flour, and refined carbohydrates of all kinds. Think of sugar—in all its various forms—as an occasional treat. This controls hunger and cravings, enhances fat loss, lowers inflammation, and keeps your metabolism balanced and working well. Low in grains/very low in gluten. For many people, small portions of gluten-free, whole grains can be part of a healthy diet, with gluten as an occasional treat. However, many people are gluten-sensitive and may have many symptoms related to gluten, including weight gain and difficulty losing weight. [7,8] Type 2 diabetics and those with autoimmune disease may want to experiment with an entirely grain-free diet. High in vegetables and fruits. Three quarters of your diet and your plate should be plants. Eat lots of low glycemic vegetables and fruits. The deeper the colors and the greater the variety, the better. This provides the phytonutrients you need for protection against most diseases. Higher in good fats. Your body needs good quality fats. Eat nuts, seeds (flax, chia, hemp, sesame, pumpkin), coconut, avocados, olive oil, fatty fish, and yes, even saturated fat from grass fed or sustainably raised animals, if you’re so inclined. The one exception to this may be for those with heart disease in which case a low-fat, vegetarian diet along with lifestyle changes (the Ornish program) can be used therapeutically to reverse heart disease. Adequate protein. Getting sufficient protein is extremely helpful for losing weight while controlling appetite and making muscle, especially when it is combined with a low glycemic load diet. Meat as a side dish. If you eat meat, focus on grass-fed or sustainably raised, clean meat, poultry, lamb, bison, or venison. If you eat beef, forego feed-lot beef, which contains fatty acids that raise cholesterol and increase inflammation, and instead eat grass-fed beef that has more cholesterol-neutral fatty acids, protective omega-3 fats, and vitamins. And don’t eat too much—make vegetables the focus and meat the side dish. Fish. If you eat fish, choose small fish low in mercury and other toxins but rich in omega-3 fats, such as sardines, herring, anchovies, or wild salmon. If you are a vegan, consider getting pre-formed DHA from algae supplements. Eggs. Some people don’t tolerate eggs, but they are a great low-cost source of vital nutrients and protein that help increase satiety and reduce overall food intake. Eggs do not increase cholesterol or heart disease like we once thought. If you eat eggs, choose organic eggs from small, local farmers if possible. Higher in quality and freshness. Focus on real, whole, fresh food that is sustainably raised. Local, fresh, and, if possible, organic foods should make up the majority of your diet. If animal products are consumed, they should be sustainably raised or grass fed. All foods should be low in pesticides, antibiotics, hormones, and GMO ingredients. Foods should contain NO chemicals, additives, preservatives, dyes, MSG, or artificial sweeteners. If you’ve tried everything to lose weight but are now heavier than ever, it’s likely there are metabolic and hormonal factors at work. These may include hormonal deficiencies, thyroid imbalance, leptin resistance, insulin resistance, mitochondrial dysfunction, metabolic insufficiency, leaky gut, food intolerances, and vitamin deficiencies. Diet and exercise are rarely successful for long-term weight loss if such metabolic and hormonal disturbances are left untreated. Health care practitioners who are experienced in identifying the underlying causes of the inability to lose weight typically have a wide range of methods to treat these conditions that ultimately can lead to successful weight loss. Don’t give up; the answers are out there and so are the people who can help. 1. Lipids Health Dis. 2014 Oct 11;13:160. 2. Int J Obes (Lond). 2014 Oct 28. 3. Cardiovasc Diabetol. 2009 Jul 16;8:35. 4. Crit Rev Food Sci Nutr. 2014 Jun 12. 5. Obesity (Silver Spring). 2007 Sep;15(9):2276-81. 6. Obesity (Silver Spring). 2013 Jun;21(6):1139-42. 7. J Am Coll Nutr. 2014;33(1):39-54. 8. J Nutr Biochem. 2013 Jun;24(6):1105-11. 9. JAMA. 1998 Dec 16;280(23):2001-7. 10. Med J Aust. 2013 Aug;199(4 Suppl):S22-6. 11. Br J Nutr. 2013 Dec;110(12):2242-9. 12. J Sci Food Agric. 2012 Nov;92(14):2774-81. 14. J Agric Food Chem. 2009 Oct 14;57(19):9044-9. 15. Eur J Nutr. 2013 Jun;52(4):1353-9. 16. BMJ. 2013 Jan 7;346:e8539. 17. Nutr Res. 2011 Jun;31(6):436-43. 18. Ann Nutr Metab. 2013;63(1-2):111-9. 2 diabetes, antibiotics, appetite, artificial sweeteners, best diet, best way to lose weight, blood sugar, calories, cholesterol, dairy, diabetes, diabetics, diet, digestive, digestive problems, exercise, fat loss, fermented foods, fiber, food, food intolerances, gluten, gluten free, glycemic load, glycemic load diet, grain free diet, health, healthy blood sugar, healthy diet, healthy weight, heart disease, high cholesterol, inflammation, insulin, insulin resistance, leaky gut, leptin, leptin resistance, Lose Weight, losing weight, low glycemic load diet, low glycemic vegetables, mercury, metabolism, muscle, nutrients, nutrition, nuts, obesity, omega 3, omega 3 fats, organic, pesticides, phytonutrients, preservatives, probiotics, protein, refined carbohydrates, reverse heart disease, stay healthy, sugar, supplements, the best diet, thyroid, toxins, type 2 diabetes, vegetables, vegetarian, vitamin, vitamins, weight gain, whole grains, wild salmon.